Geometric nesting vessels, slip cast porcelain, 2017. 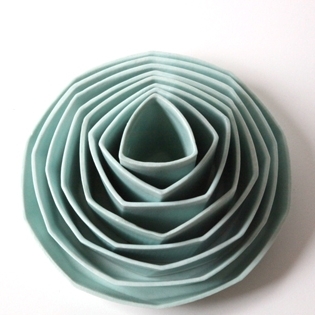 Happy Medium is an exhibition of new ceramic objects. The title refers to my feelings about working with clay, as well as an approach to craft making that seeks to strike a balance between traditional and digital processes. The pieces in this exhibition are the result of my early experiments with wheel throwing, hand building, slip casting, computer-aided design and 3D printing. They reflect my growing interest in how craft is being redefined and practiced in the post-digital age. The exhibition is being held at Queensland College of Art's Project Gallery from 22 November until 2 December. Opening hours are 11am - 4pm Tuesday - Saturday.